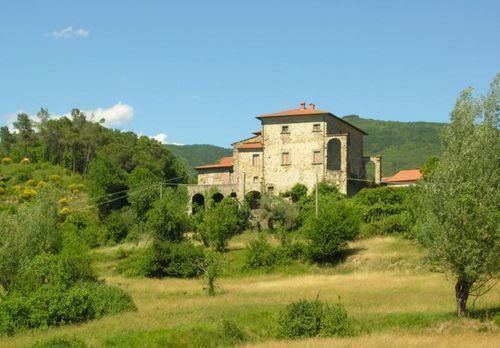 Detached farmhouse in the Tuscan hills. 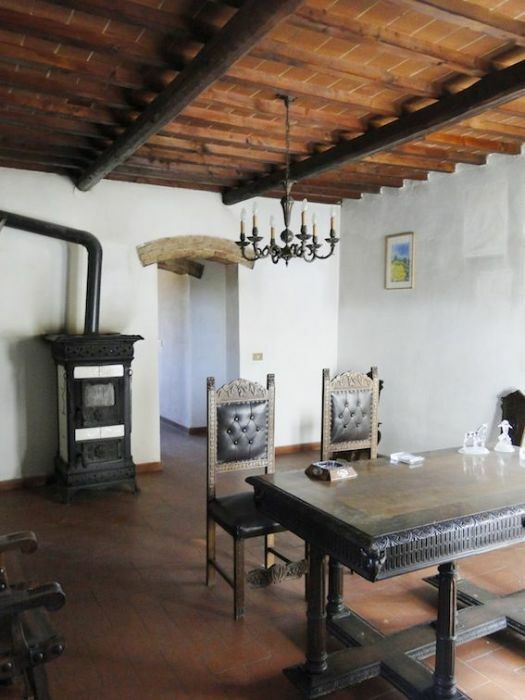 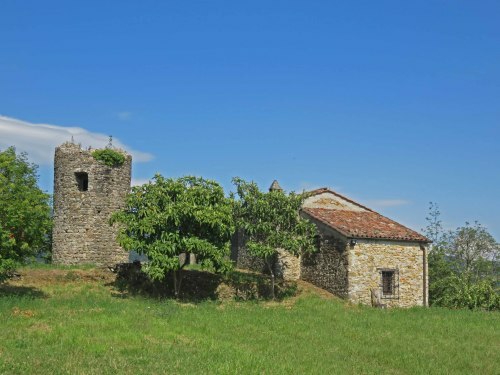 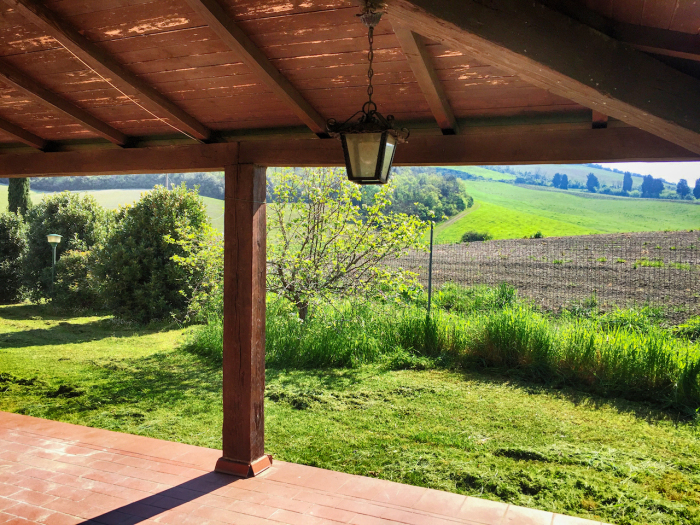 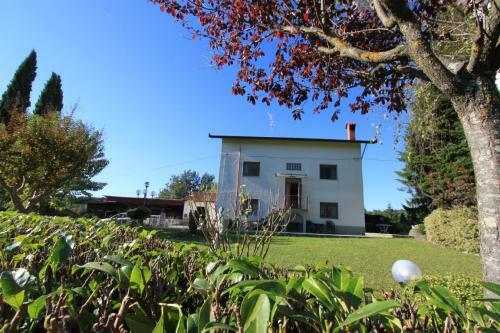 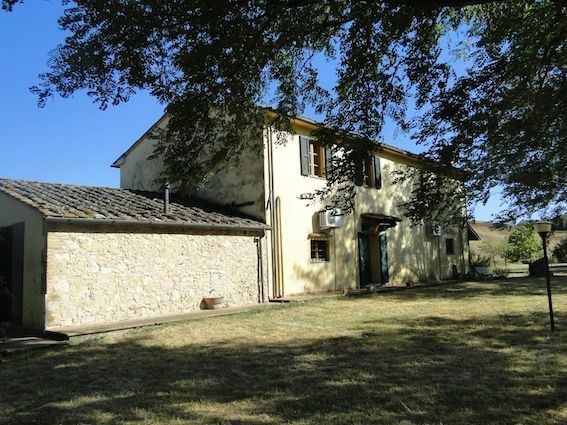 Beautifully restored, spacious farmhouse of 350 sqm, surrounded by 2000 sqm of lawned garden. 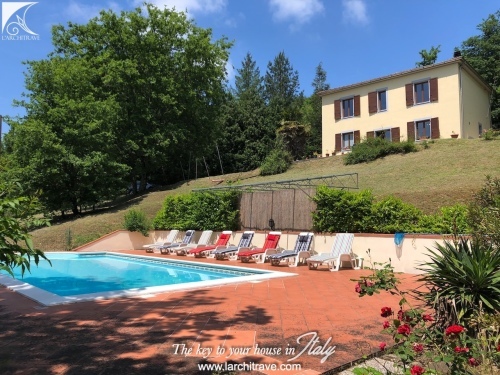 There is a swimming pool in the garden which requires restoration. 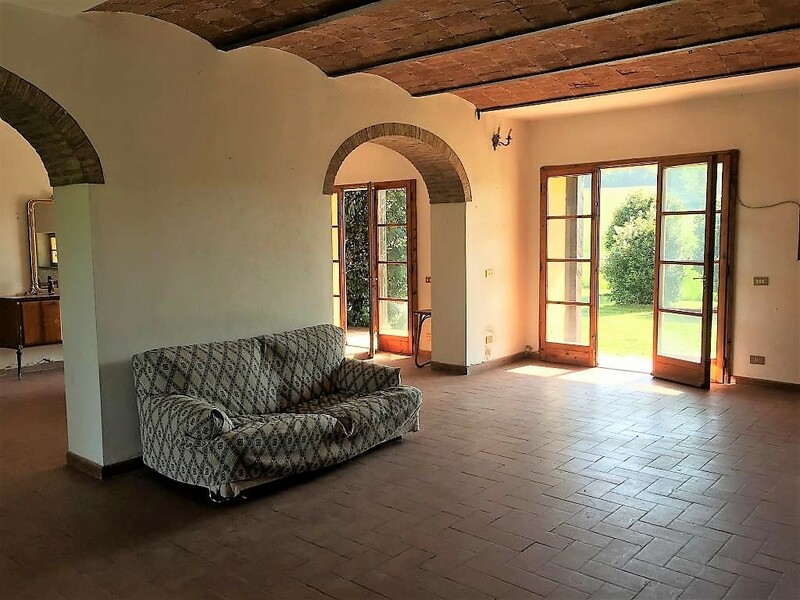 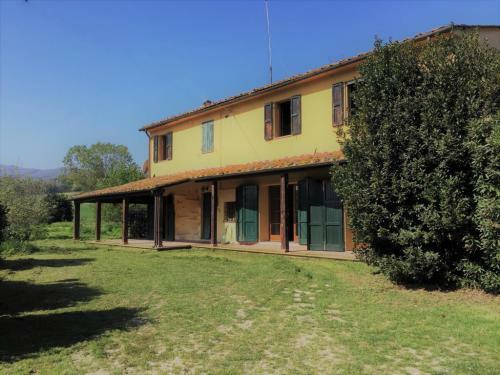 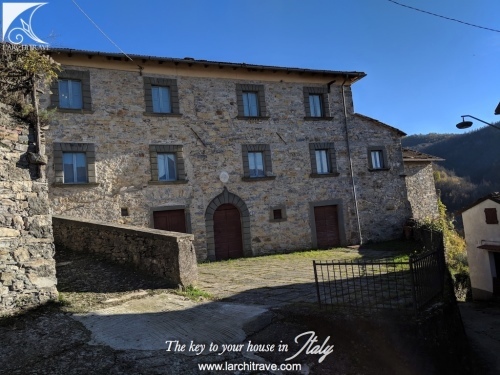 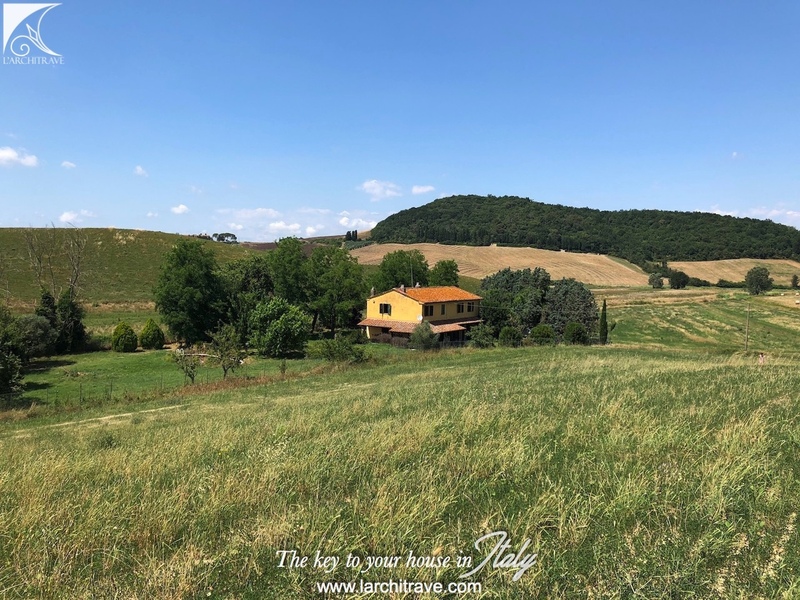 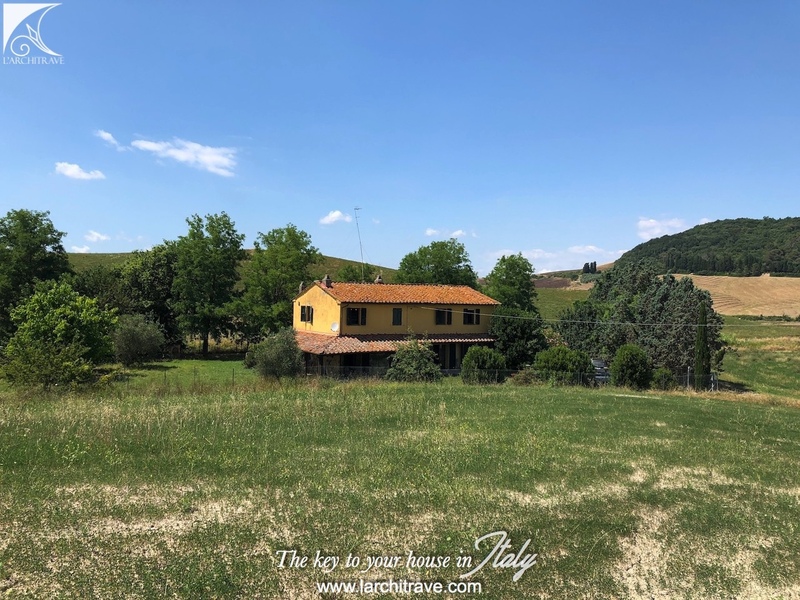 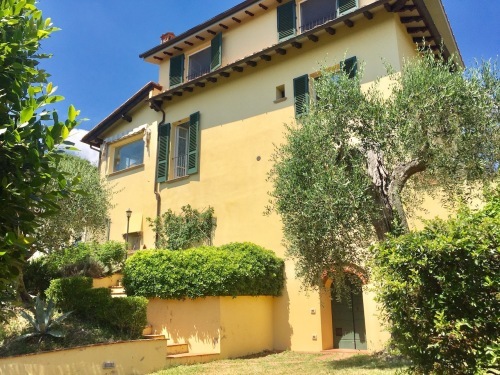 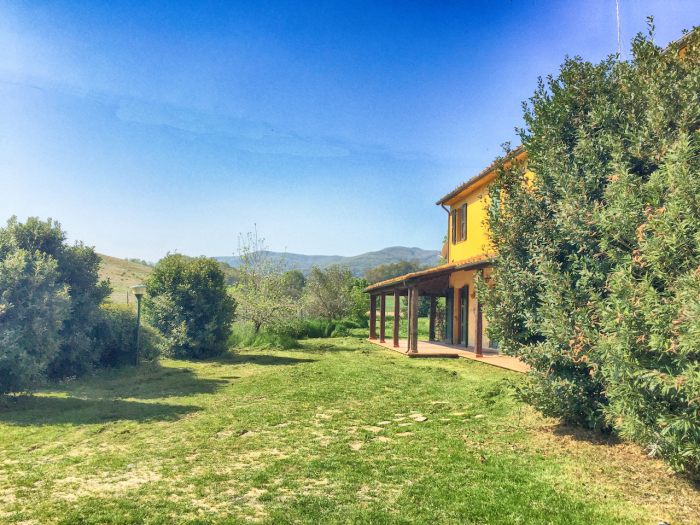 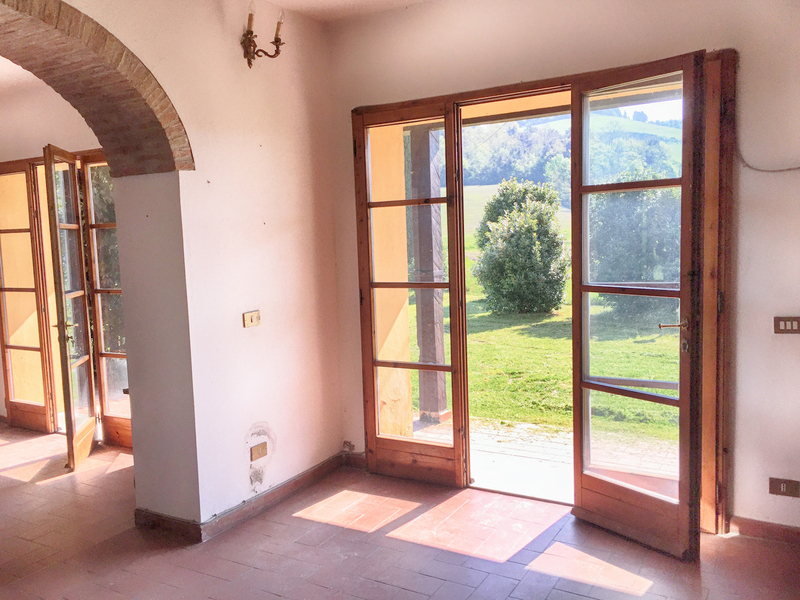 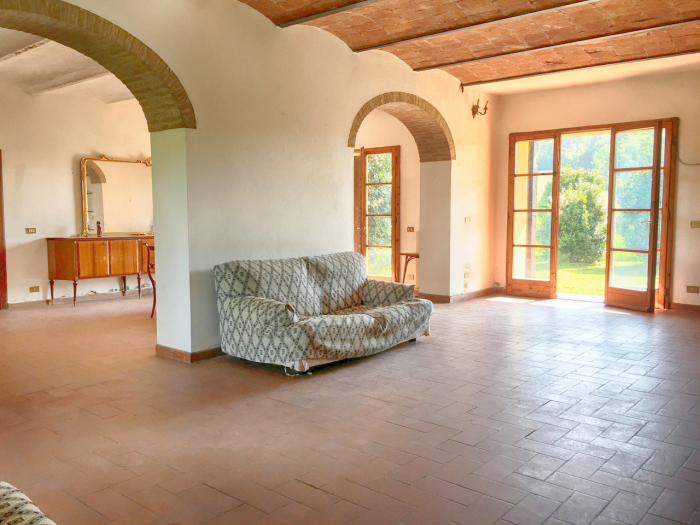 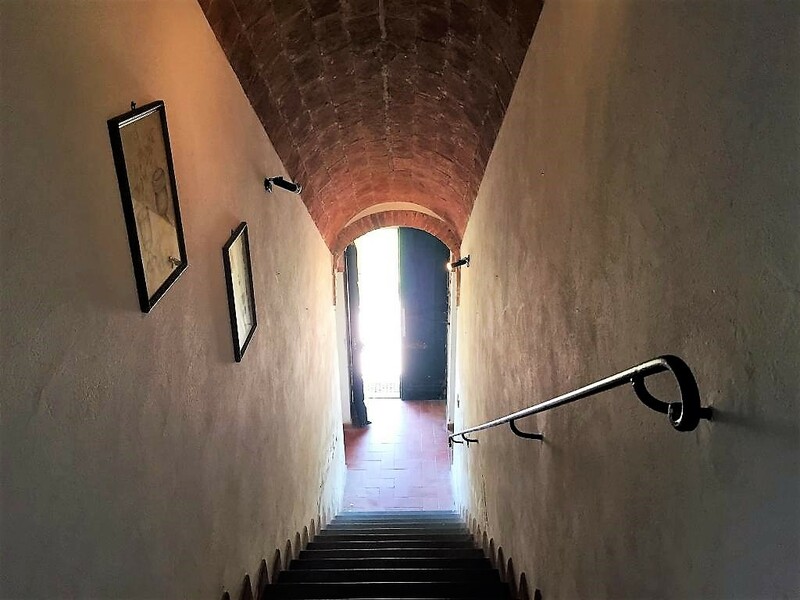 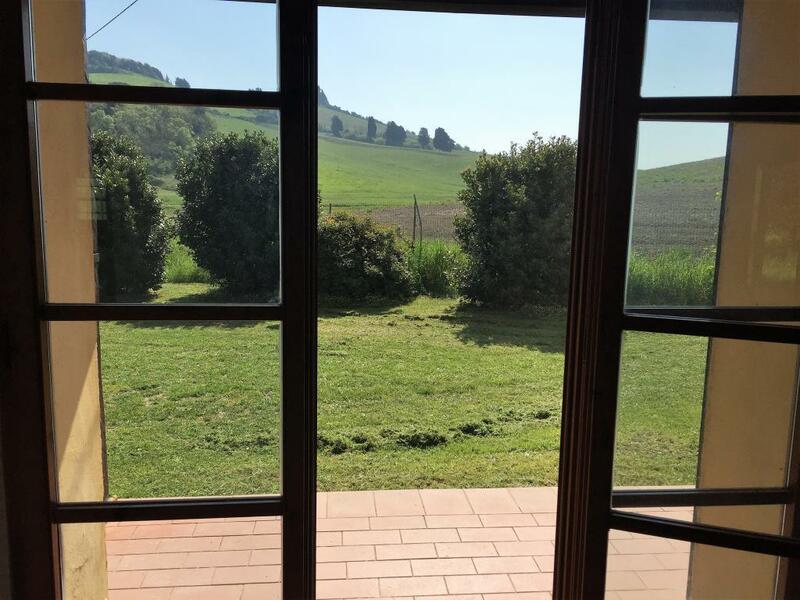 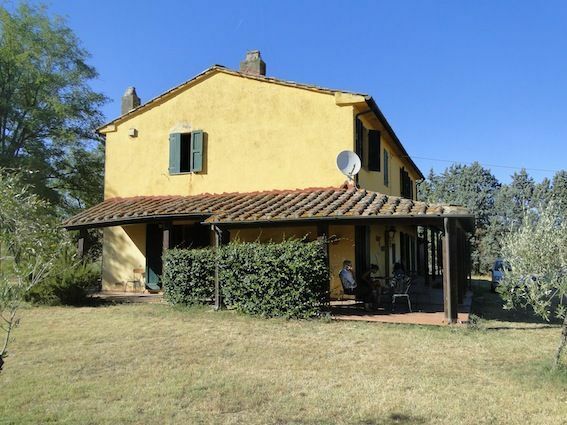 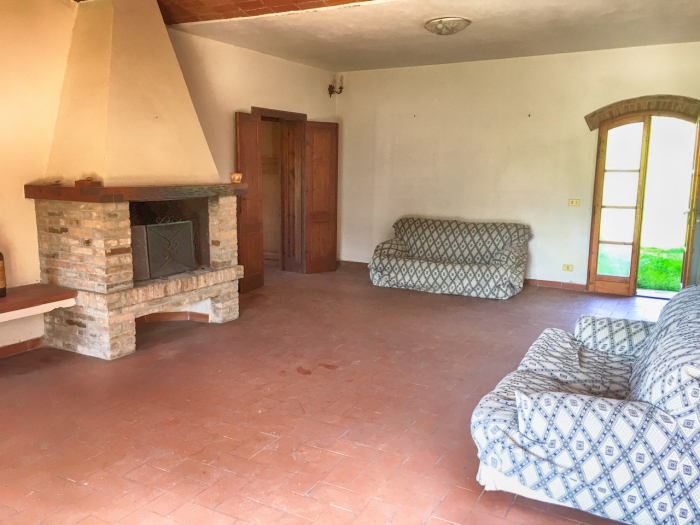 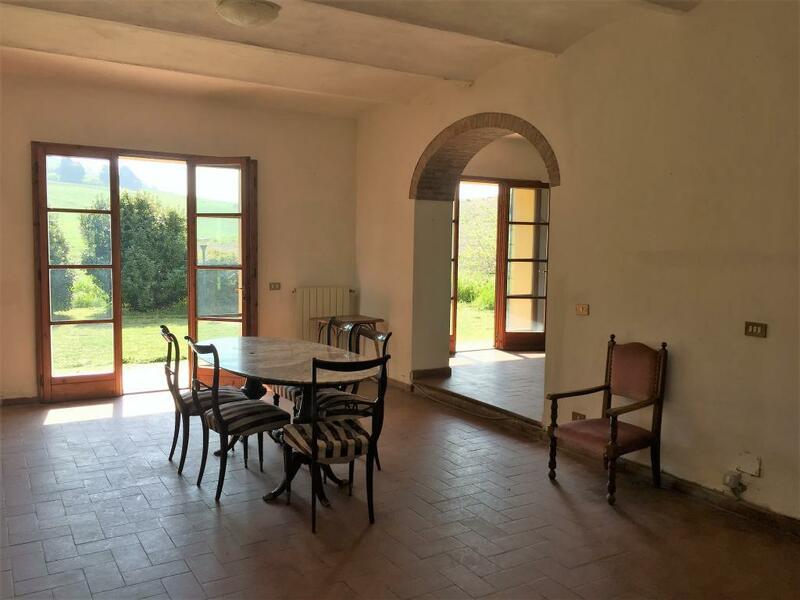 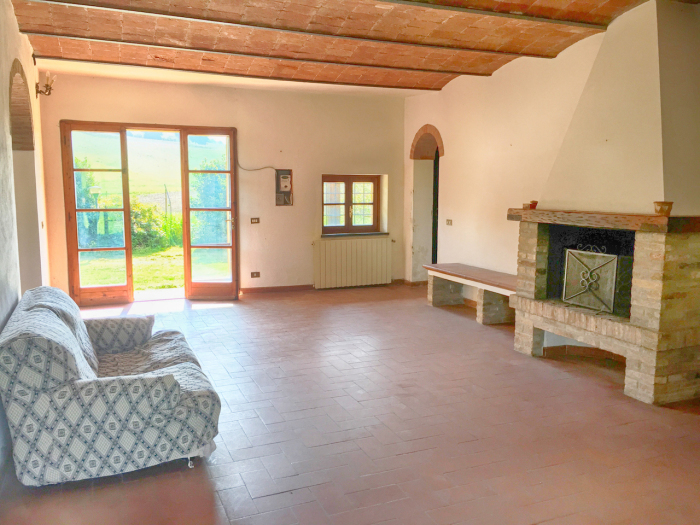 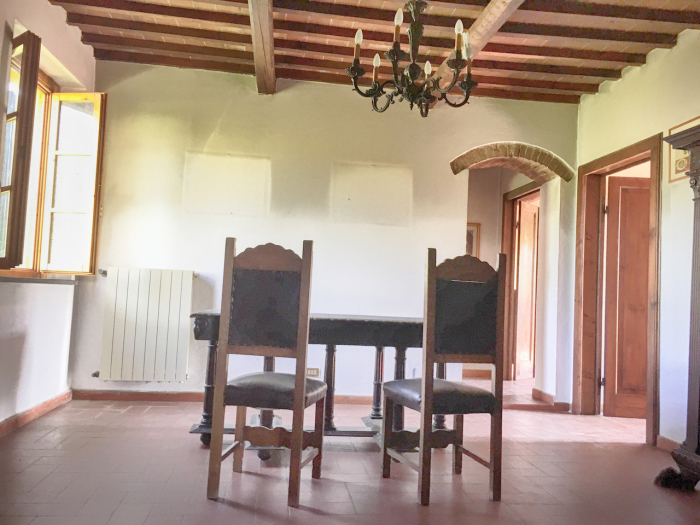 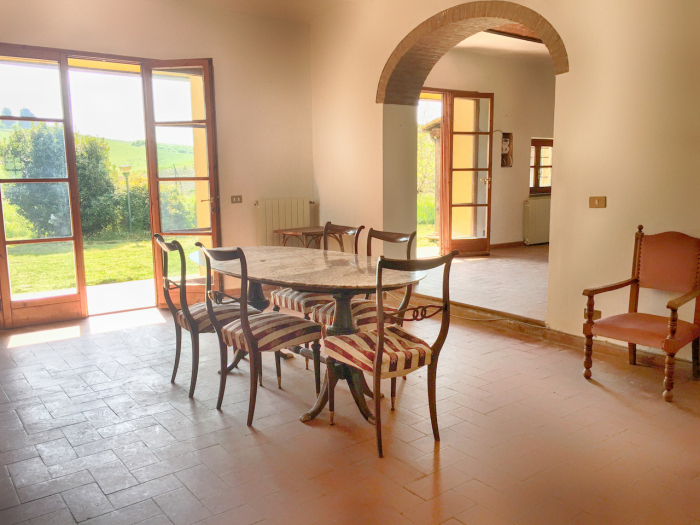 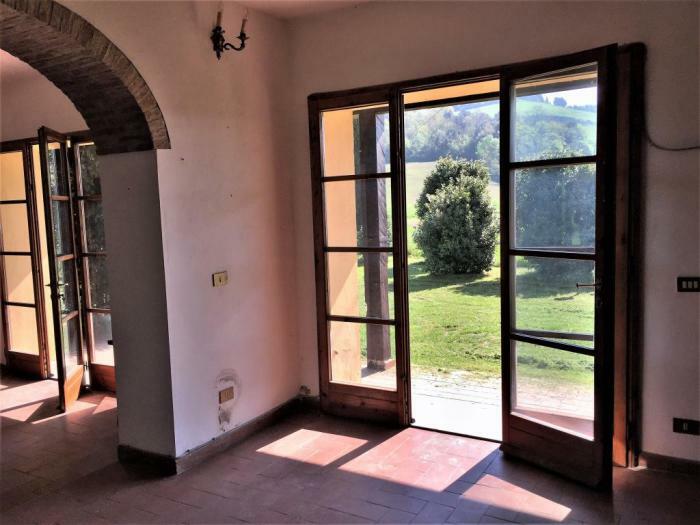 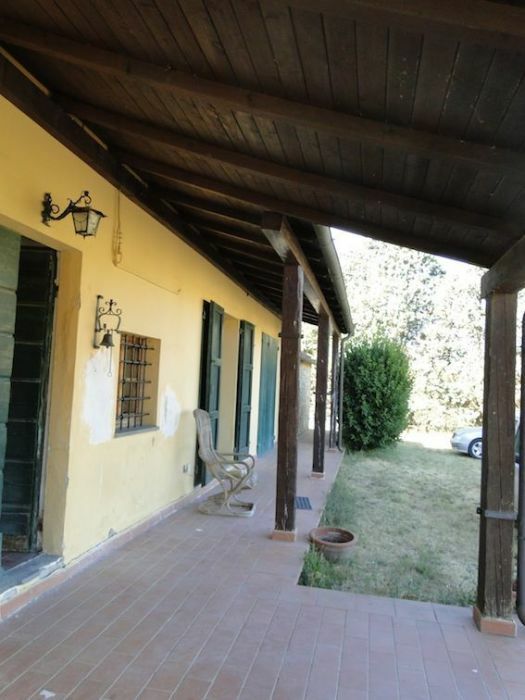 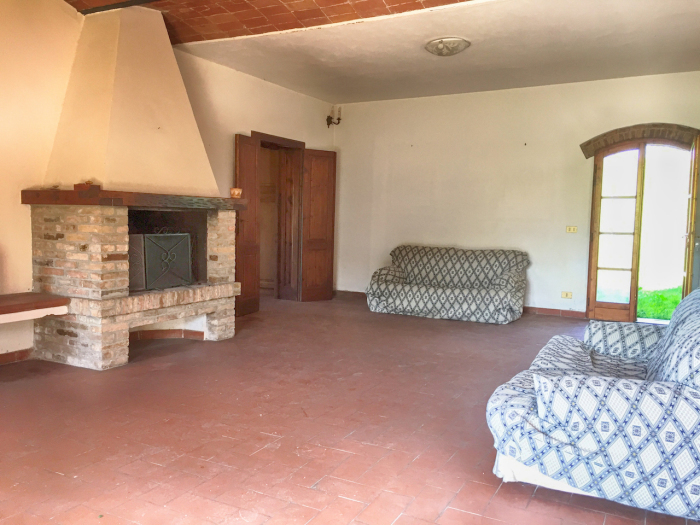 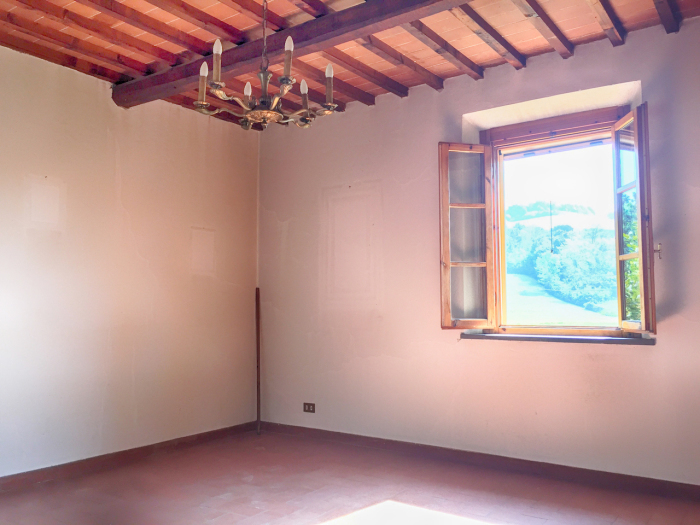 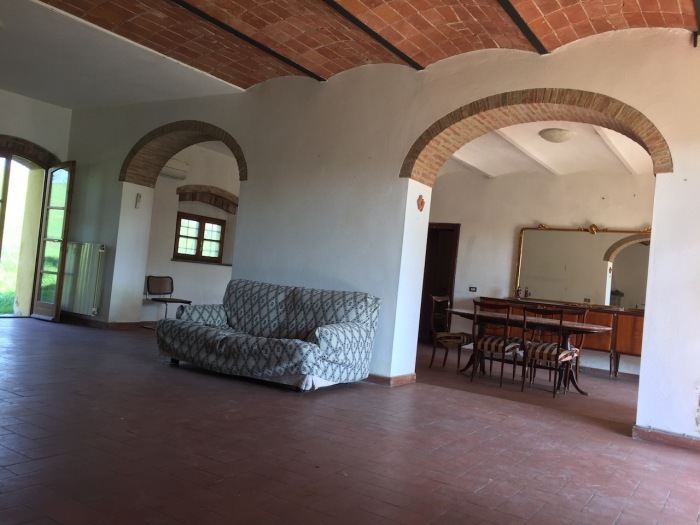 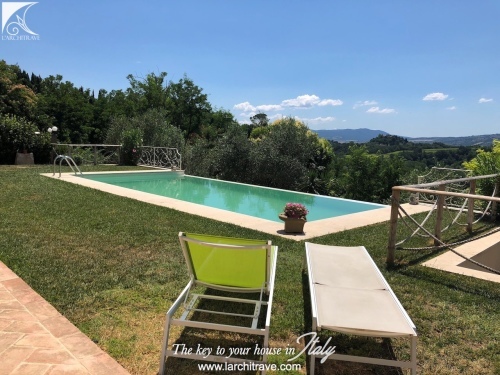 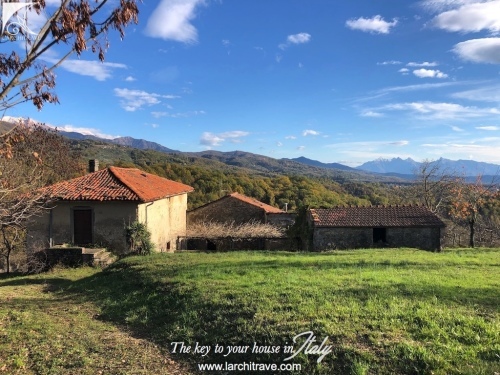 The house is a traditional Tuscan farmhouse with character accommodation and comprises a spacious double area living room with fireplace, kitchen and separate dining room both with fireplace, bathroom, laundry room and a garage on the ground floor. There are large Tuscan brick arches and wide doors to the portico which runs the full width of the house. 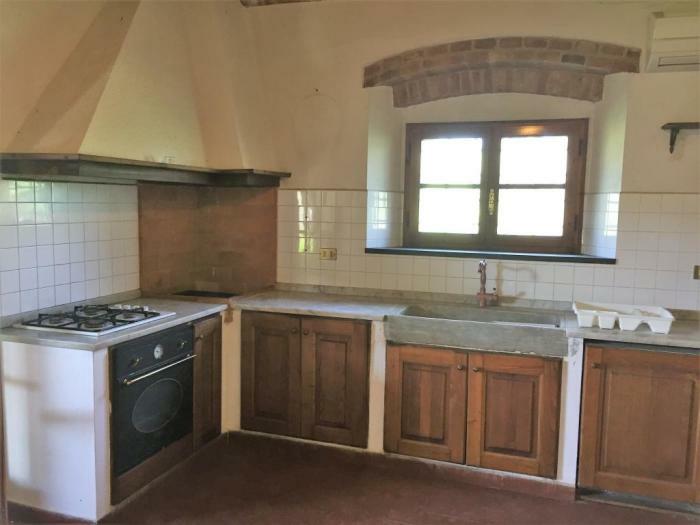 The traditional kitchen is hand-built in chestnut wood, with ancient sink and marble worktops. 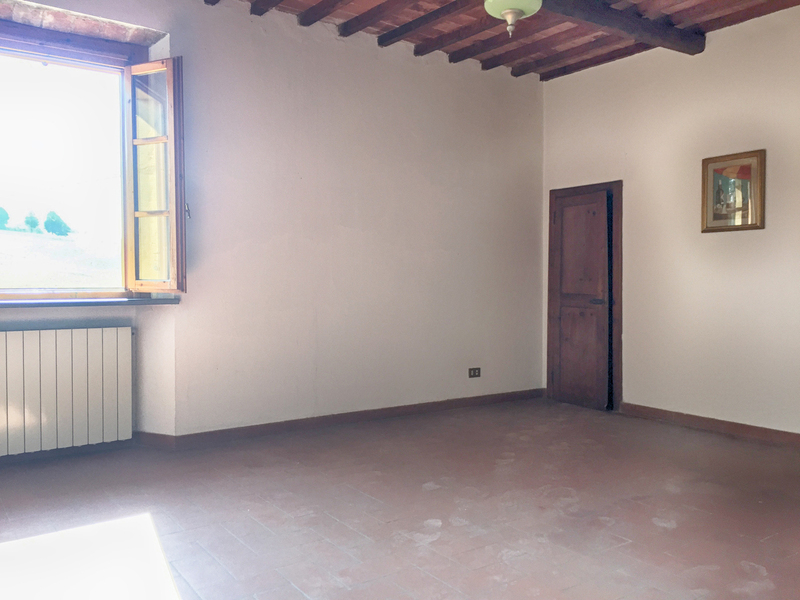 on the first floor there are 3 bedrooms, 2 bathrooms and 2 rooms used as studies which can both provide also extra bedroom space. 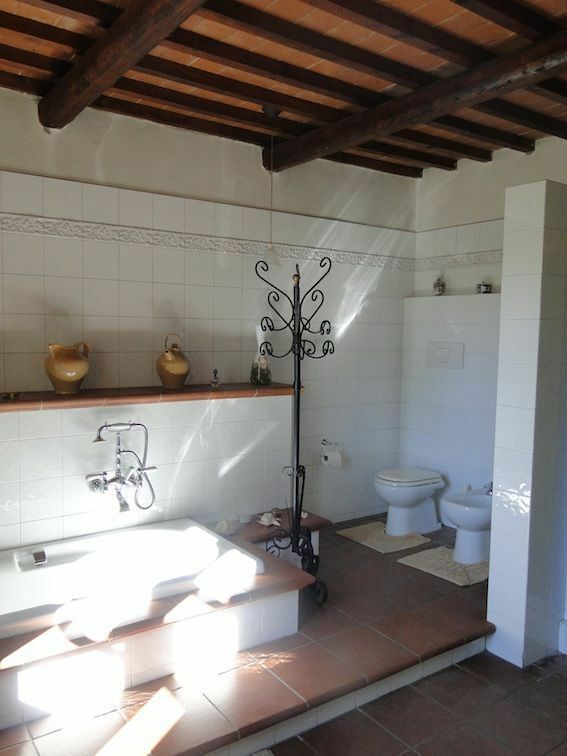 The house is connected to utilities with central heating. 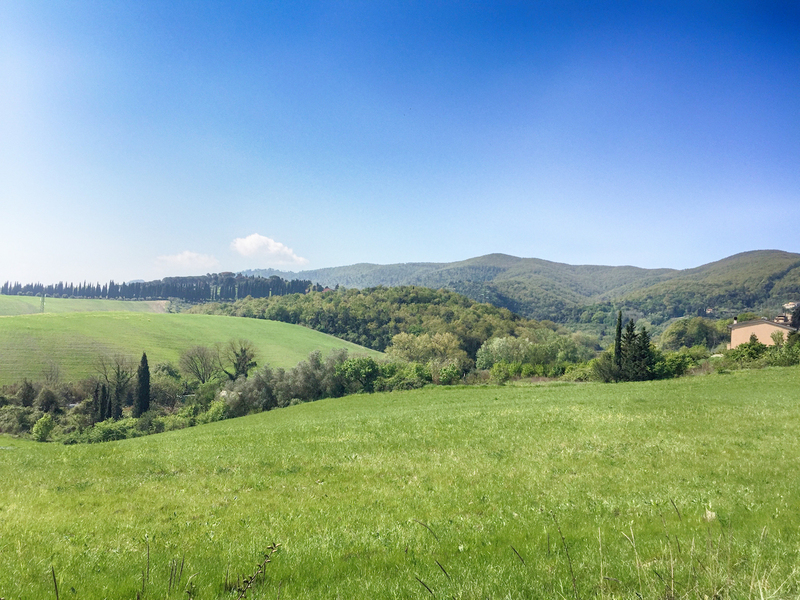 Lovely views of the surrounding countryside of meadows and hills. 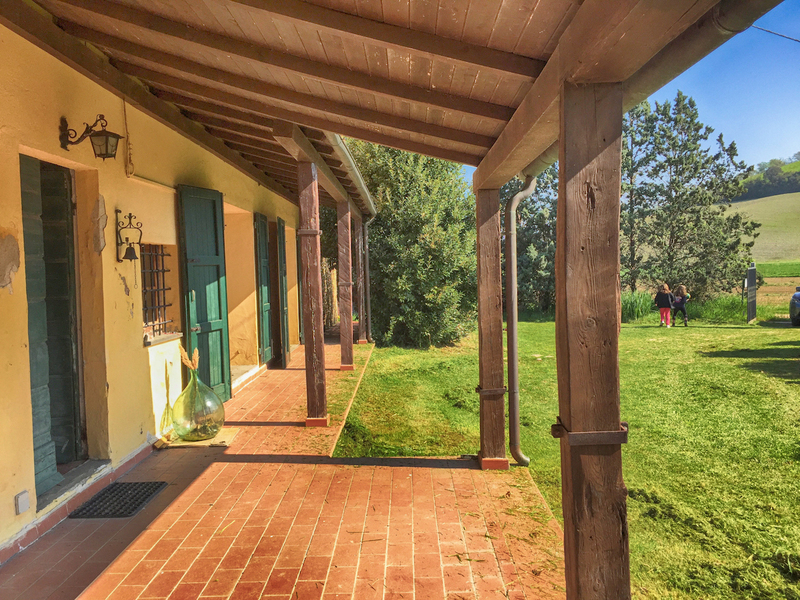 There is a great connection between the inside and outside space. 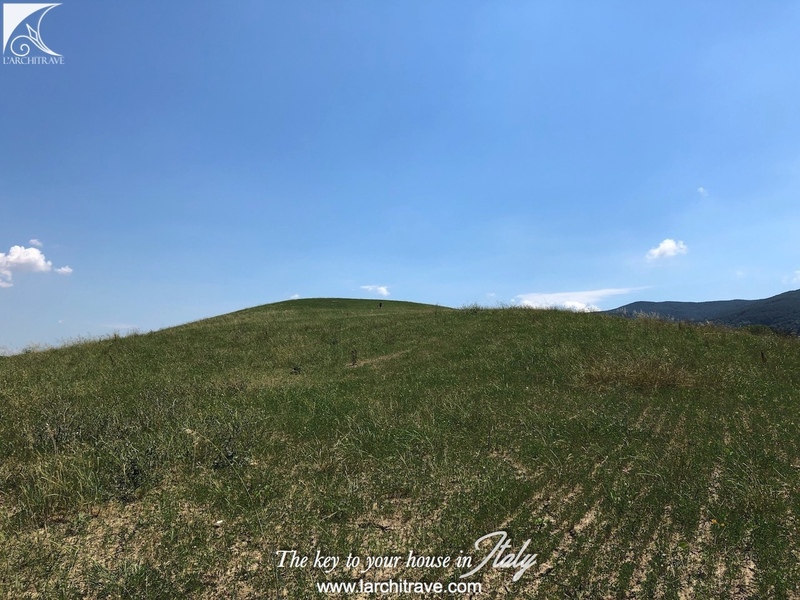 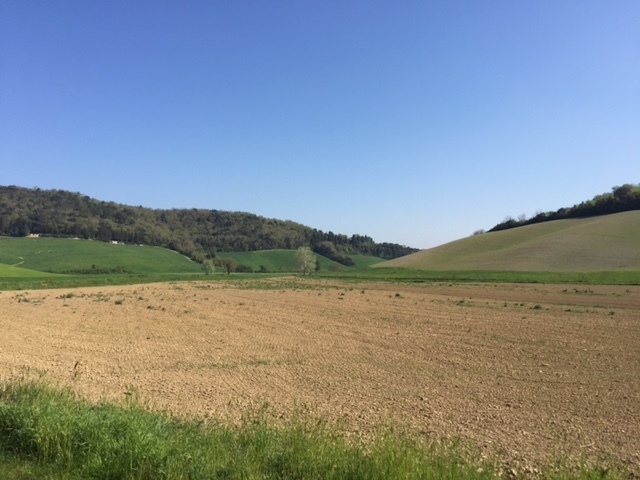 Set in the Tuscan countryside yet within easy access to the airport at Pisa (24 km) and the beaches (19 km). 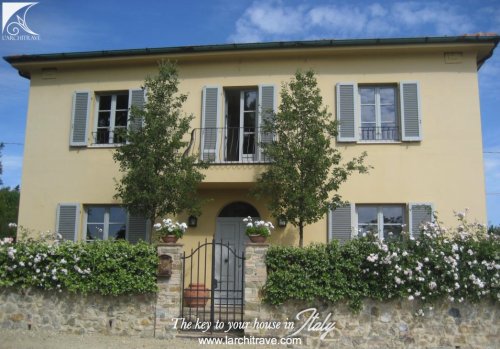 The small medieval village is typical of Tuscany with cobbled lanes and surrounded with meadows and olive groves. 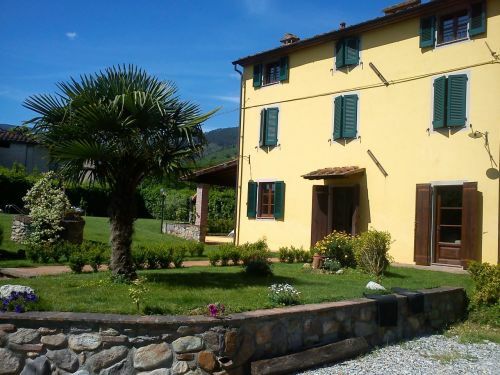 There is a bar in the village and the large town of Collesalvetti with supermarkets is just 8 km. 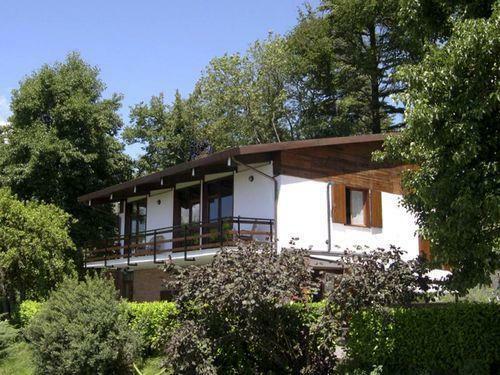 Casciana Terme is a lively spa town with good restaurants and beautiful spa facilities with natural warm pools. 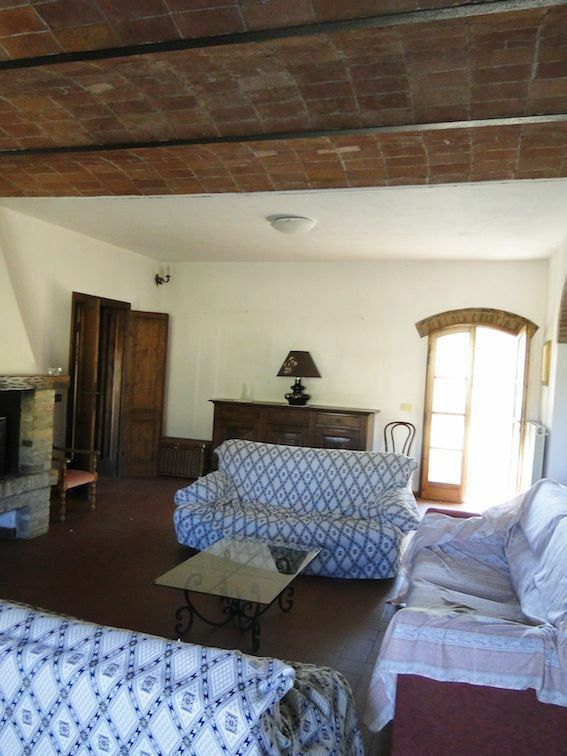 Livorno with its antique port side bustling with fishing boats and fish restaurants is just 15 km.